Just a simple example, showing how to self-host ASP.NET Web API. On an elevated console (“Run as administrator”), execute “netsh http add urlacl url=http://+:8080/ user=<your user name>”, to allow the running user to listen on port 8080. On Visual Studio, create a “Console Application” project. Change the project’s Target Framework property from “.NET Framework 4 Client Profile” to “.NET Framework 4 profile”. Create a public ApiController derived class. 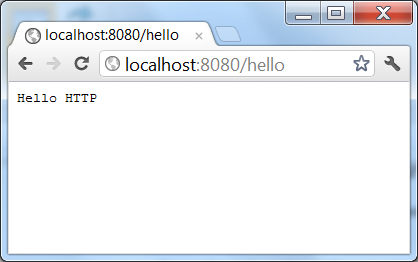 Create a HttpSelfHostConfiguration, initialized with the base address. Create a HttpSelfHostServer, initialized with the above configuration object. Open the server, bearing in mind that the OpenAsync method is asynchronous. Run the program, open a browser and access http://localhost:8080/hello. That’s it. You now have a self-hosted ASP.NET Web API server. This entry was posted in Software and tagged asp.net web api on February 26, 2012 by pedrofelix. I take it I could run the app As a windows service instead of a console app? Also if I was to deploy this on the server, all I would do is need to change the httpselfhostconfiguration(“http://localhost:8080”) to the URL which is pointing at the server? 1) Yes, you could run as a windows service. 2) What do you mean by “deploy on the server”? Is it on top of IIS? If so, you don’t use HttpSelfHostConfiguration. On a production server you add the url’s address to the host headers of a website in iis, how would i wire up the web API to capture the http requests to a given domain which is pointing at that server, change the value passed through httpselfhostconfiguration?. Yes your correct not onto of iis. From my observations, the host name of the address that you pass to the HttpSelfHostConfiguration ctor is ignored. I’ve tried to follow the steps you outlined and I get a 404 with the error “No type was found that matches the controller named ‘hello'”. I’m sure I’m making some very simple mistake. Any ideas? Thanks! Is the HelloController class public? Is it in the same assembly? Is HelloController a nested class? Ah! It was not public. A stupid error! Thanks. I get an error “Could not load file or assembly ‘System.Web.Http.Common, Version=4.0.0.0”. Make sure you include the reference in you project!